Atopic eczema is a chronic inflammatory disease of the skin which causes the skin to become extremely dry and itchy. The itch in atopic dermatitis is so severe it can take over your life. And after you scratch, the skin becomes inflamed. Eventually this leads to an inflammatory reaction which creates a cycle where the itch causes inflammation and the inflammation leads to more itching. Acupuncture and Chinese herbal medicine help eczema by reducing inflammation, itch, and restoring the body to its natural balance. Atopic eczema develops because of an interaction between the individual and the environment. A person has a genetic propensity for dry skin and allergies when contact with soaps and irritants trigger the development of eczema(1). The rates of eczema are on the rise, which suggests environmental factors in the condition such as changes in diet, dust accumulation from poor ventilation, excess washing and harsher soaps may all be factors in eczema development (1). Atopic skin tends to be dry, shows a tendency for the overgrowth of staphylococcus aureus, higher pH, and a deficiency in gamma-linolenic acid (GLA) (2). Allergies to foods, mold, or irritant substances may cause a flare in the condition (3). Atopic eczema is often treated with topical steroids that suppress the inflammatory response. Unfortunately, steroids also have many side effects. Research has shown that Chinese herbal medicine is linked to a reduction in corticosteroid use in children (4). Traditionally, Chinese medicine has called eczema the “wind of four crooks” referring to the most common locations of the eczema rashes on the inside of the elbows and knees (5). 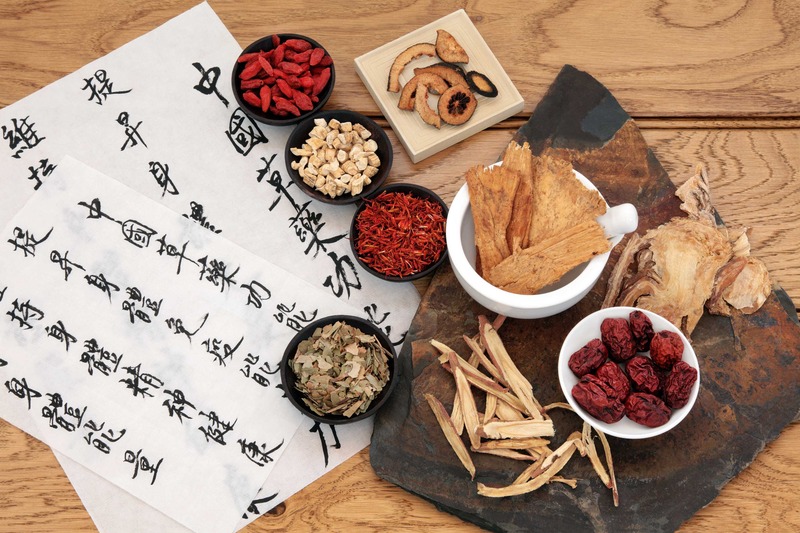 Traditional Chinese Medicine understands eczema as an imbalance of body’s energy which allows external pathogenic factors to attack causing itch, inflammation, as well as dry and red skin. Chinese medicine treats eczema not by suppressing the immune response but rather correcting the imbalances that are causing the eczema. By correcting or removing these imbalances, Chinese medicine reduces inflammation and allows your body is able to heal on its own. In eczema, the most common underlying imbalances are dampness, heat, and wind. To determine the imbalance, I will observe how the skin looks. If the skin is dry, cracked, and irritated, then too much heat may be the most significant factor in the eczema. If there is more swelling, crusting, and vesicles, then dampness may be the most significant factor. Because Chinese medicine is holistic, we also consider how digestion, allergies, sleep, and emotional health play a role. 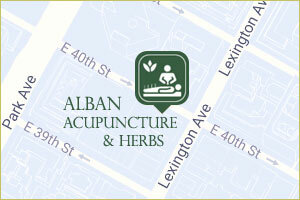 Acupuncture points and herbs are selected specifically for their ability to correct that specific imbalance. 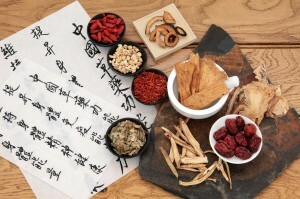 Chinese herbal medicine focuses on correcting the imbalance causing the eczema. If heat is the cause of the eczema, we will use herbs that traditionally are used to clear heat from the body. Many of the heat clearing herbs have been shown to have potent anti-inflammatory and immunoregulatory properties (6). If dampness is causing the eczema, herbs that drain dampness are used. Studies have shown that these herbs reduce inflammation, itch, and inhibits growth of Staphylococcus aureus (7). There are also herbs specifically for the symptoms. For example, di fu zi (broom cypress) is very effective in reducing itch. Acupuncture is very effective to control the itching in eczema (8). 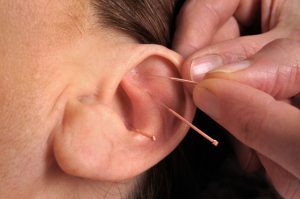 I find that auricular and body acupuncture combination to be the most effective. After the acupuncture, I often will use magnet stickers in ear acupuncture points that correspond to the specific area of the body the itch is found. It is possible that the same physiological mechanisms which acupuncture uses to reduce pain are effective for stopping itch in eczema. PubMed Health. Atoptic Eczema. Accessed 5/14/2013. Muluye RA, Bian Y, Alemu PN. Anti-inflammatory and Antimicrobial Effects of Heat-Clearing Chinese Herbs: A Current Review. J Tradit Complement Med.2014;4(2):93-98. He X, Fang J, Huang L, Wang J, Huang X.Sophora flavescens Ait. : Traditional usage, phytochemistry and pharmacology of an important traditional Chinese medicine. J Ethnopharmacol. 2015 Aug 22;172:10-29. Pfab F, Huss-Marp J, Gatti A., et al. Influence of acupuncture on type I hypersensitivity itch and the wheal and flare response in adults with atopic eczema – a blinded, randomized, placebo-controlled, crossover trial.Allergy. 2010 Jul;65(7):903-10. Epub 2009 Dec 11. Li J, Zhang F, Li J. The Immunoregulatory Effects of Traditional Chinese Medicine on Treatment of Asthma or Asthmatic Inflammation. Am J Chin Med.2015;43(6):1059-1081; PMID: 26364661.